Figure 1 - Small electric winnower with metal stand. (Optional) if electricity is accessible, the gas engine can be replaced with a ½ to ¾ horsepower capacitor start electric motor (1725 rpm). The "Roto-Hoe" shredder has six sets of three free swinging hammers (F). Convert the six set of hammers into six rasp bars as follows: Cut the 5/8 inch tubing (D) in segments to fit between the free swinging hammers (F). Tie the free swinging hammers (F) together by inserting the 5/8 inch bolt (B) into the hole of the first hammer, followed by a segment of tubing (D) as spacer, then another hammer, followed by a second segment of tubing, followed by the third hammer. Drill a 5/32-inch hole on the threaded portion of the bolt that protrudes from the third hammer. Reassemble the bolt, hammers, and spacers together and lock the bolt in place with the cotter pin (C) installed in the 5/32-inch hole. This assembly constitutes a rasp bar. Repeat the above procedure and tie together the remaining five sets of free-swinging hammers. Manually rotate the rasp bars and check for clearance between the rasp bars and the walls of the threshing chamber. If there is insufficient clearance, adjust the bolt position, grind the bolt head, or cut the bolt length to obtain the necessary clearance between the rasp bars and the walls. 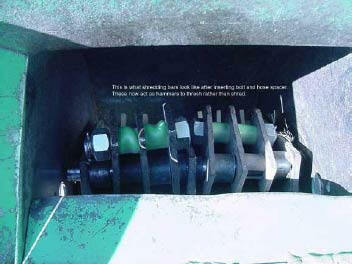 The Roto-Hoe shredder exit port consists of a slotted section and a 3/4-inch diameter punched-hole screen. Use the sheet metal or cardboard (E) and C clamps (A) to block the slotted portion of the exit port (G). The threshed grain exits through the 3/4-inch holes. Start the engine and spin the rasp bars. Again, check for clearance between the rasp bars and the walls of the threshing chamber. If there is a knocking sound, grind the bolt down to obtain the necessary clearance. Start the engine and spin the rasp bars. Dried plant materials with vines, stems, and leaves are fed in batches through the hopper. After threshing for 1 to 3 seconds, open the top door to eject the longer vines, stems, and leaves that have not been chopped up. Seeds and small bits of plant material exit through the punched holes at the bottom. The mixture of seeds and plant material must be separated after threshing. 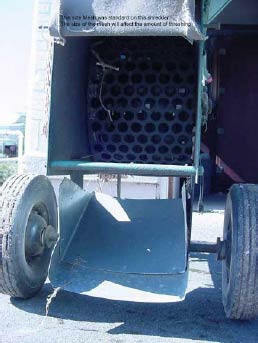 The 3/4-inch diameter holes in the exit port are suitable for larger seeds (e.g. beans) and seeds with loosely attached husks (e.g. wheat, bok choy, and amaranth). Small seeds and seeds with tight husk or pods (e.g. barley, clover and radish) require smaller diameter exit holes to retain the larger unthreshed materials while passing the smaller threshed grains. This can be achieved by attaching a screen with smaller openings under the 3/4-inch diameter punched holes. Thresher made from a converted chipper-mulcher. 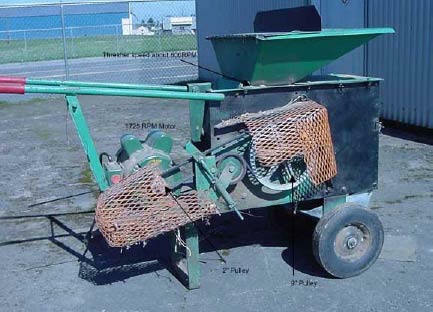 Thresher hammers are bolted together so that they beat plant material but do not shred or grind it. Mesh keeps the plant material within the thresher until it is small enough to pass through. Smaller mesh would result in more finely chopped material while larger mesh would result in larger chopped plant material.